It’s a time of transition. 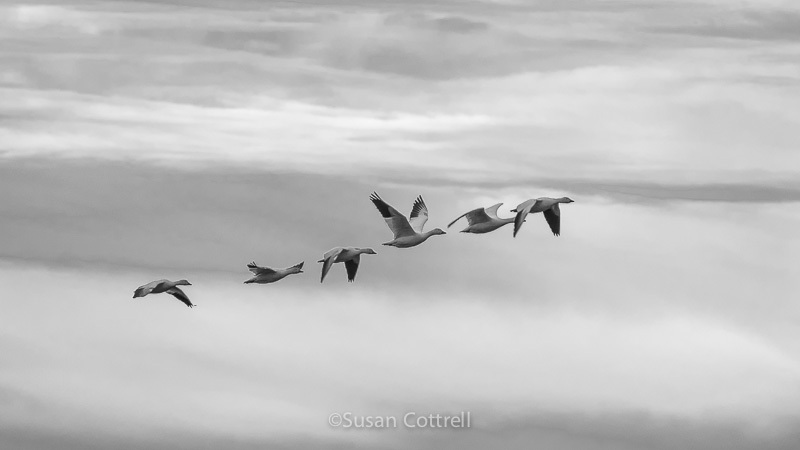 Snow Geese are getting ready to head back north to their breeding grounds. There is a calmness that comes when they return each fall and a melancholy when they leave in the spring. But it is these cycles that make it all work and it is their calls in the sky, no matter which direction they are flying, that signal all is well. 16 Mar	This entry was published on March 16, 2014 at 20:32. It’s filed under Birds, Nature, Pacific Northwest, Sky and clouds and tagged arctic, calmness, cycles, flying, geese, melancholy, migration, Skagit County, Snow Geese, waterfowl, Wrangel Island. Bookmark the permalink. Follow any comments here with the RSS feed for this post. Very cool image, simple, elegant and moving. Thanks for posting it, a little more peace in the day now. Thank you Tim! I’m honored to receive such kind words from an accomplished photographer such as yourself.